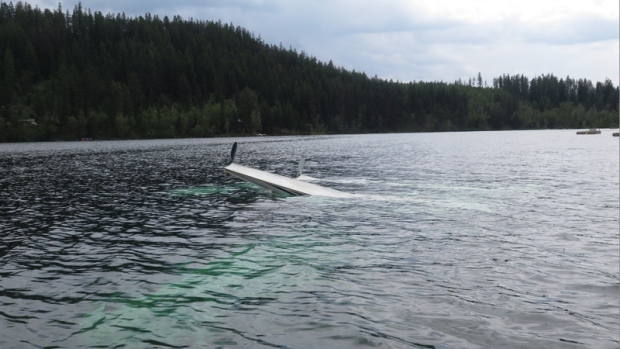 A photo from the scene posted by the Transportation Safety Board of Canada showed the Cessna 180H was almost completely submerged in Tyaughton Lake. The Transportation Safety Board has released new details about a deadly plane crash in B.C. 's West-Central Interior this past summer. Two people, both passengers, died when the Cessna 180H crashed into Tyaughton Lake in Gold Bridge on Aug. 1. The safety board says one of the passengers – working as an instructor pilot on the flight – noticed a fuel leak from the left wing and instructed the pilot to turn back and land on the lake. "Given the local terrain, the pilot reduced the airspeed and banked the aircraft steeply to the right, turning back toward the lake. The aircraft then abruptly rolled further to the right and struck the lake in a near-vertical attitude at approximately 1255," the TSB said in a report. However, the safety agency says the aircraft experienced a loss of control after starting to turn and crashed. The TSB says the pilot was properly certified and fatigue is not considered a factor in the accident.